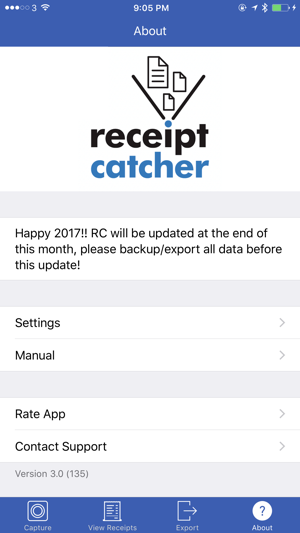 No account to set up, no hidden charges, just a simple and honest Receipt Tracking app that can be retrofit into any expense system at work or at home. 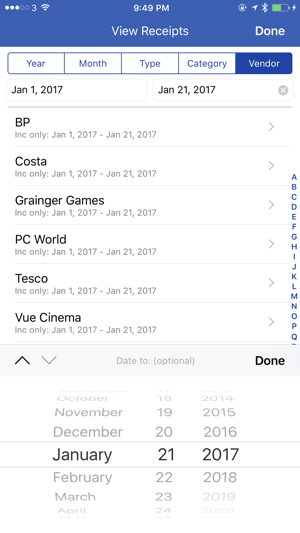 • Snap fits receipt images to an A4/US letter page no other app does this; you can pick the amount of images you would like and the resolution (through the settings). • iCloud support for keeping track of your expenses on multiple devices - All receipts backed up, NEVER LOSE A RECEIPT AGAIN! 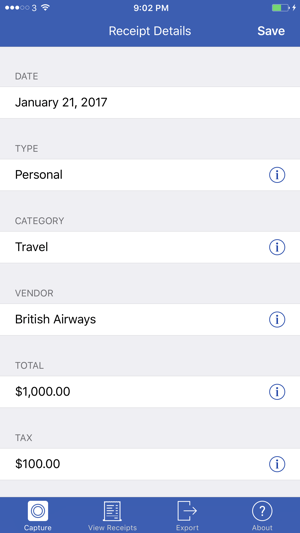 • Add Receipt images and chose to add details later, or just export 'Uncategorised Receipts' and email to your admin and let them plug in the figures, before you get back from your trip. Do you work for a company? Do you log expenses? Maybe you are sick of having that pile of personal receipts at home, and want something to organise them and make them easy to track? Whether you log expenses at your work place, or would just like to keep track of your personal expenses, Receipt Catcher is for you. It takes the pain out of the expenses process. It is a very simple yet effective app. • Categorise your receipt entries by type, category and vendor. • Enter the amount of the cost, any tip amount and tax amount. • Option to use any currency in the world with a built in currency converter. 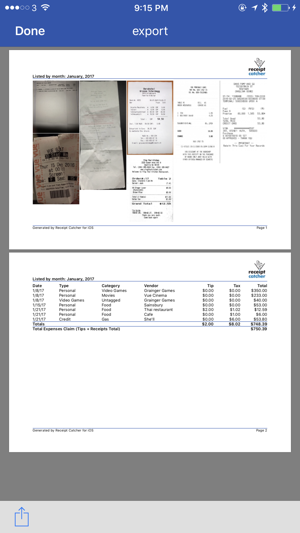 • Take a snap shot of the receipt with ability to crop it! Or import a previously taken image or electronic receipt from your photo library. Now for the special bit, the receipts are automatically fitted/aligned to fit on A4 or US Legal paper(s). Choose between landscape or portrait format and customise the layout. No more going back to the office and photocopying receipts, Snap as you go!!! Once you have done the above, you can email the receipts and a breakdown of all costs directly to the admin, or to yourself to print off and submit. 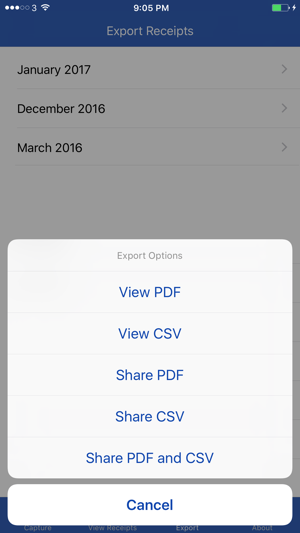 Exported reports can include your personal details and even a company logo or custom image. Export by year, month, type, category or vendor and add date filters to export only the receipts you want (requires upgrade via in-app purchase, the standard version exports by month only). This will make your office expenses so much easier to submit and traceable. Maybe your administrator will even endorse this app for all iPhone users in your office to make easier admin for them! • Designed to be used in ANY country! Thank you for a simple to use and effective app. I’ve been using it for 5 years and will continue to use it. Please add the ability for receipt catcher to do income and expenses. I use the application to track income and expenses for rental properties, a cattle ranch, and leases. I currently have to manually adjust the excel spreadsheet output to distinguish income from expenses before I send the file to my accountant. Love this app! But that would be great if a user could add original currency and its amount, as well the exchange rate used, to the report. Also, not all expenses come as receipts. Sometimes we need to capture and log a letter sized bill or an invoice as a separate page. Please add that feature to the app. I wish I had used it more often a great tool to have.I found it very useful when submitting paper work to company’s .